Our 2018 calendar can be personalized to make the perfect gift. If you love escaping to the vast views of snow capped mountains, then you’re sure to appreciate the views revealed inside. Check Availability on Amazon.com or customize further by choosing from our links below. or Click Here to Customize, order large sizes, or bulk orders. Our 2018 Mountain Calendar is offered in several wall sizes and even allows customization. 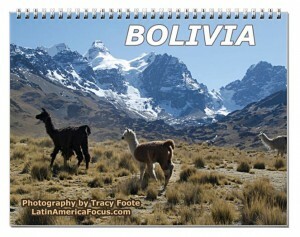 Find 12 months of unique inspirational photos of Bolivian majestic mountains and glaciers. January begins with images from Sajama National Park, over to the bordering edge of Chile with views of the twin peaks known as Los Payachatas: (el Parinacota y el Pomerame), through the Zongo Valley to Huayna Potosi and the no longer used Chacaltaya ski lift, to overlooking the Sorata Valleys, and Palca Canyon. Tracy Foote’s spent her childhood summers at camp in the Adirondack Mountains in upstate New York where she developed a love of nature, the outdoors, and mountain climbing. Her first image of Bolivia was a photograph of a snow capped Chacaltaya mountain. (Global warming has since melted this snow away, but it continues to attract tourist for it’s history and magnificent views.) She hopes to inspire enthusiasm for travel and the preservation of the surrounding historical environment using her photographs to create unique gift ideas for those with a passion for Bolivia. Purchase with confidence and security. Click through our links below to our products found on Amazon.com.